Something about the summertime revives my eagerness to pick up a good book. What greater indulgence is there on a summer afternoon than to sit poolside with a page-turner? In all likelihood I will not have that luxury this summer, but I'm hoping to stock the kindle with books to fuel late night baby parties to be had. 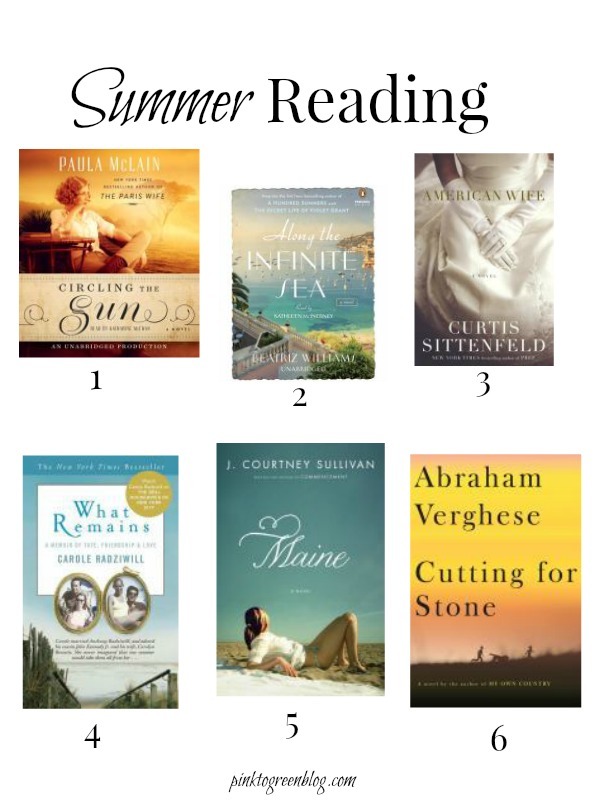 I've rounded up some my recent reads and some old favorites as summer reading recommendations. Over on Instagram, you can follow along with what we're reading (#pinktogreenreads) and I have also added a new tab at the top of the page called shop which will allow you to browse the books we love, old and new! Now, I'd love to hear from you... what should I add to my list? Are you using Good Reads? Happy Summer reading! Oh I haven't read any of these! I will check some out. Thanks! I haven't read any of these! I've been reading baby books the last few months, so I'm excited to dig into some fun reading this summer :) First on my list is After You, the sequel to Me Before You! Thanks for reading list. I always check out the books you recommend. I need to check these out! I haven't read anything good lately but I've been on the search for something. I always love hearing what others are reading.